We provide cages for guinea pigs and have a range of choices to make sure your pets are catered to in the luxury they deserve. All accomodation includes unlimited hay, bedding and readigrass. Each cage is supplied with a shelf with ramp, hidey house, toys, food bowl, salad plate, hay rack and water bottle (or bowl if preferred). Accomodation best suited for one or two piggies. A standard cage with ramp and shelf to sit on or shelter under. 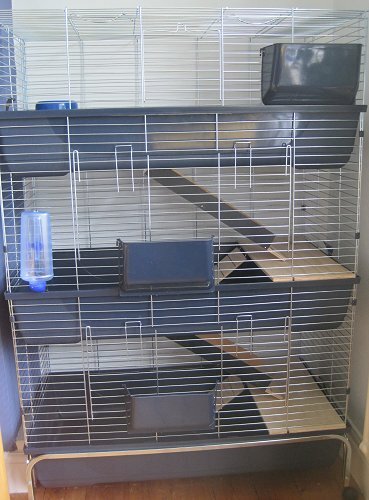 A larger single storey cage (not pictured) is available for up to three piggies. Adds an extra dimension for your guinea pigs to explore. Two floors with lots to do including hidey houses and toys. Suitable for a small group. An extra large two-tier cage is also available. A true luxury for your guinea pigs - cavy heaven! Three expansive floors, ramps, runs and numerous shelters. The ultimate guinea pig hotel. Suitable for bonded groups but also as a special treat for adventurous guineas. We apologise in advance if they don't want to go home! All bedding and hay is complementary. You will need to supply your guinea pig's regular dry and fresh food to ensure continuity of diet. We are happy to purchase further fresh vegetables and fruit throughout your pet's stay and this will be charged on collection. © TynePets, Gosforth, Newcastle upon Tyne, Tyne and Wear 2019.